RPC-075 is inactive as of 27/05/2006. 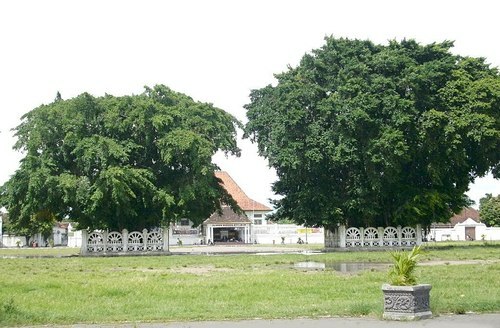 Alun-Alun Kidul is to be reopened to the public on ██/██/2006. It has been confirmed that RPC-075 is indirectly connected to RPC-005 but lost its anomalous properties when RPC-005 caused a 5.9 scale earthquake on 27/05/2006. The Board has come to a decision to detach all on-site assets following the neutralization of RPC-075. RPC-075 is hereby classified as Neutralized and all research is to be archived in NS-00. The Board will expect greater security personnel performance from now on. Containment Protocols: All evidence of RPC-075's anomalous properties that are spread to the mass media are to be omitted by MSF X-ray-6 "Annullifiers". No civilian is to be granted access into the Alun-Alun Kidul in which RPC-075 is located. The containment campaign is to be given a cover of a sinkhole reparation and all of OL Site-107 is to be declared prone to collapse. Cooperation with the Indonesian government has been established to give the Authority complete control on RPC-075 and its surrounding area. In the case of intrusion, subjects are to be apprehended by on-site security and held for questioning. Usage of Class-C amnestics may be approved by on-site Head Security if deemed necessary. Testing With RPC-075 are to be done in the late hours of the night (23:00-01:00 local time) with the perimeter around Alun-Alun Kidul cleared of any civilian and/or unauthorized recording devices. Description: RPC-075 are two instances of Ficus Benjamina trees measuring approximately 30 meters tall located in the middle of Alun-Alun Kidul, Special Region of Yogyakarta, Indonesia (-7.8119, 110.36319). RPC-075 is named accordingly by its position; RPC-075-1 for the west tree and RPC-075-2 for the east tree. Researchers have been able to pinpoint the approximate age of the trees by measuring its diameter and its growth factor; approximately ███ years old. The anomalous properties of RPC-075 manifest when any human attempts to cross the gap between the two trees. Upon doing so, the subject will lose control of their motor functions and are compelled to change their course off of the gap. As of ██/██/2006, no subject has successfully crossed the gap. However, tests with animals have indicated that non-sapient lifeforms can pass through the gap without suffering the anomalous effects of RPC-075. Any attempts to disfigure the trees' bark will result in the accelerated aging of the perpetrator by ███%. Victims will exhibit the typical characteristics and symptoms of an aged human (e.g. Alzheimer's Disease, organ failure, reduced bone density, etc.). However, disfigurement of the hanging roots and/or leaves does not seem to affect the perpetrator in any way. The full list of victims and test subjects are available in Document 075-A. Despite its anomalous properties, researchers have been successful in analyzing a sample of RPC-075-1's bark without suffering from its effects. Initial analysis of the bark showed no extra-normal properties aside from the fact that the sample rots slower than other instances of Ficus Benjamina trees. It is suspected that RPC-075 has a connection to RPC-005 due to its close proximity and several local folklore surrounding RPC-075. Investigation on whether RPC-075 is connected to RPC-005 is currently ongoing. Foreword: Dr. Malina Reynolds is investigating the potential connection between RPC-005 and RPC-075. Dr. Reynolds: What can you tell me about RPC-075; the two Banyan trees in Alun-Alun Kidul, Yogyakarta? RPC-005: Beringin Kembar? It used to be the gate between my kingdom and theirs. Dr. Reynolds: I'm sorry, whose kingdom? RPC-005: My descendants' kingdom. Last time I was there, Sultan Hamengkubuwono IX is in control. Dr. Reynolds: Okay, and what purpose does this gate serve? RPC-005: A symbol. People would offer sesembahan; tribute below the tree. Dr. Reynolds: So it's not used to deter intruders from your kingdom? RPC-005: It used to. Until they don't need me anymore. Several sources suggest that RPC-075 was indeed a gate between the Yogyakarta Sultanate and RPC-005's supposed dimension. The Masangin tradition that was done every 1st Suro1, where the Topo Bisu ritual is taken place prophesied that only the noblest person can pass through the gap. The mythology that arose when Sultan Hamengkubuwono I reigned suggests that RPC-075 was a test to find a noble husband for his daughter. However, there is no evidence of a human that has successfully crossed the gap during the ███ years from RPC-075 first stood. 1. The first month in the Javanese calendar.